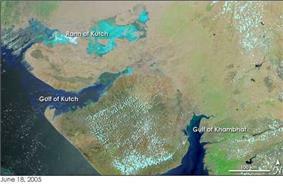 To the northwest of Lothal (2400 BCE) lies the Kutch peninsula. Proximity to the Gulf of Khambhat allowed direct access to sea routes. Lothal's topography and geology reflects its maritime past. Indian maritime history begins during the 3rd millennium BCE when inhabitants of the Indus Valley initiated maritime trading contact with Mesopotamia. The Roman historian Strabo mentions an increase in Roman trade with India following the Roman annexation of Egypt. By the time of Augustus up to 120 ships were setting sail every year from Myos Hormos to India. As trade between India and the Greco-Roman world increased spices became the main import from India to the Western world, bypassing silk and other commodities. Indians were present in Alexandria while Christian and Jew settlers from Rome continued to live in India long after the fall of the Roman empire, which resulted in Rome's loss of the Red Sea ports, previously used to secure trade with India by the Greco-Roman world since the Ptolemaic dynasty. The Indian commercial connection with South East Asia proved vital to the merchants of Arabia and Persia during the 7th–8th century. On orders of Manuel I of Portugal, four vessels under the command of navigator Vasco da Gama rounded the Cape of Good Hope, continuing to the eastern coast of Africa to Malindi to sail across the Indian Ocean to Calicut. The wealth of the Indies was now open for the Europeans to explore. The Portuguese Empire was one of the early European empires to grow from spice trade. 5 April marks the National Maritime Day of India. On this day in 1919 navigation history was created when SS Loyalty, the first ship of The Scindia Steam Navigation Company Ltd., journeyed to the United Kingdom, a crucial step for India shipping history when sea routes were controlled by the British. The region around the Indus river began to show visible increase in both the length and the frequency of maritime voyages by 3000 BCE. Optimum conditions for viable long-distance voyages existed in this region by 2900 BCE. Mesopotamian inscriptions indicate that Indian traders from the Indus valley—carrying copper, hardwoods, ivory, pearls, carnelian, and gold—were active in Mesopotamia during the reign of Sargon of Akkad (c. 2300 BCE). Gosch & Stearns write on the Indus Valley's pre-modern maritime travel: Evidence exists that Harrappans were bulk shipping timber and special woods to Sumeria on ships and luxury items such as lapis lazuli. The trade in lapis lazuli was carried out from northern Afghanistan over eastern Iran to Sumeria but during the Mature Harrappan period an Indus colony was established at Shortugai in Central Asia near the Badakshan mines and the lapis stones were brought overland to Lothal in Gujarat and shipped to Oman, Bahrain and Mesopotamia. The world's first dock at Lothal (2400 BCE) was located away from the main current to avoid deposition of silt. Modern oceanographers have observed that the Harappans must have possessed great knowledge relating to tides in order to build such a dock on the ever-shifting course of the Sabarmati, as well as exemplary hydrography and maritime engineering. This was the earliest known dock found in the world, equipped to berth and service ships. It is speculated that Lothal engineers studied tidal movements, and their effects on brick-built structures, since the walls are of kiln-burnt bricks. This knowledge also enabled them to select Lothal's location in the first place, as the Gulf of Khambhat has the highest tidal amplitude and ships can be sluiced through flow tides in the river estuary. The engineers built a trapezoidal structure, with north-south arms of average 21.8 metres (71.5 ft), and east-west arms of 37 metres (121 ft). Roman trade with India according to the Periplus Maris Erythraei (1st century CE). It should be mentioned here that Tamil Pandya embassies were received by Augustus Caesar and Roman historians mention a total of four embassies from the Tamil country. Pliny famously mentions the expenditure of one million sestertii every year on goods such pepper, fine cloth and gems from the southern coasts of India. He also mentions 10,000 horses shipped to this region each year. Tamil and southern Sanskrit name inscriptions have been found in Luxor in Egypt. In turn Tamil literature from the Classical period mentions foreign ships arriving for trade and paying in gold for products. The first clear mention of a navy occurs in the mythological epic Megasthenes (c. 350—290 BCE), is attributed to Candragupta Maurya (reign 322—298 BCE). The Mauryan empire (322–185 BCE) navy continued till the times of emperor Ashoka (reign 273—32 BCE), who used it to send massive diplomatic missions to Greece, Syria, Egypt, Cyrene, Macedonia and Epirus. Following nomadic interference in Siberia—one of the sources for India's bullion—India diverted its attention to the Malay peninsula, which became its new source for gold and was soon exposed to the world via a series of maritime trade routes. The period under the Mauryan empire also witnessed various other regions of the world engage increasingly in the Indian Ocean maritime voyages. According to the historian Strabo (II.5.12.) the Roman trade with India trade initiated by Eudoxus of Cyzicus in 130 BCE kept increasing. Indian ships sailed to Egypt as the thriving maritime routes of Southern Asia were not under the control of a single power. In India, the ports of Barbaricum (modern Karachi), Barygaza, Muziris, Korkai, Kaveripattinam and Arikamedu on the southern tip of India were the main centres of this trade. The Periplus Maris Erythraei describes Greco—Roman merchants selling in Barbaricum "thin clothing, figured linens, topaz, coral, storax, frankincense, vessels of glass, silver and gold plate, and a little wine" in exchange for "costus, bdellium, lycium, nard, turquoise, lapis lazuli, Seric skins, cotton cloth, silk yarn, and indigo". In Barygaza, they would buy wheat, rice, sesame oil, cotton and cloth. The Ethiopian kingdom of Aksum was involved in the Indian Ocean trade network and was influenced by Roman culture and Indian architecture. Traces of Indian influences are visible in Roman works of silver and ivory, or in Egyptian cotton and silk fabrics used for sale in Europe. The Indian presence in Alexandria may have influenced the culture but little is known about the manner of this influence. Clement of Alexandria mentions the Buddha in his writings and other Indian religions find mentions in other texts of the period. The Indians were present in Alexandria and the Christian and Jew settlers from Rome continued to live in India long after the fall of the Roman empire, which resulted in Rome's loss of the Red Sea ports, previously used to secure trade with India by the Greco—Roman world since the time of the Ptolemaic dynasty. Textiles from India were in demand in Egypt, East Africa, and the Mediterranean between the 1st and 2nd centuries CE, and these regions became overseas markets for Indian exports. In Java and Borneo, the introduction of Indian culture created a demand for aromatics, and trading posts here later served Chinese and Arab markets. 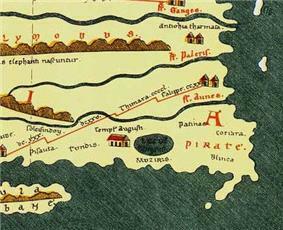 The Periplus Maris Erythraei names several Indian ports from where large ships sailed in an easterly direction to Khruse. Products from the Maluku Islands that were shipped across the ports of Arabia to the Near East passed through the ports of India and Sri Lanka. After reaching either the Indian or the Sri Lankan ports, products were sometimes shipped to East Africa, where they were used for a variety of purposes including burial rites. Chola territories during Rajendra Chola I, c. 1030. 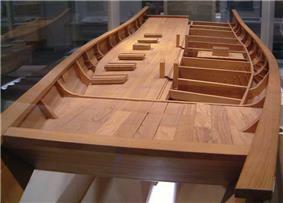 Model of a Chola (200—848 CE) ship's hull, built by the ASI, based on a wreck 19 miles off the coast of Poombuhar, displayed in a Museum in Tirunelveli. The Chola dynasty (200—1279) reached the peak of its influence and power during the medieval period. Emperors Rajaraja Chola I (reigned 985-1014) and Rajendra Chola I (reigned 1012-1044) extended the Chola kingdom beyond the traditional limits. At its peak, the Chola Empire stretched from the island of Sri Lanka in the south to the Godavari basin in the north. The kingdoms along the east coast of India up to the river Ganges acknowledged Chola suzerainty. 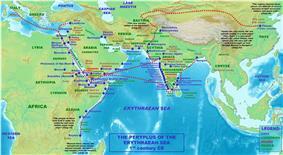 Chola navies invaded and conquered Srivijaya in Maritime Southeast Asia. Goods and ideas from India began to play a major role in the "southernization" of the wider world from this period. Quilon or Kollam in Kerala coast, once called Desinganadu, has had a high commercial reputation since the days of the Phoenicians and Romans. Fed by the Chinese trade, it was mentioned by Ibn Battuta in the 14th century as one of the five Indian ports he had seen in the course of his travels during twenty-four years. Desinganadu's rulers were used to exchange the embassies with Chinese rulers and there was flourishing Chinese settlement at Quilon. The Indian commercial connection with Southeast Asia proved vital to the merchants of Arabia and Persia between the 7th and 8th centuries CE. Merchant Sulaiman of Siraf in Persia (9th Century) found Quilon to be the only port in India, touched by the huge Chinese junks, on his way from Carton of Persian Gulf. Marco Polo, the great Venician traveller, who was in Chinese service under Kublahan in 1275, visited Kollam and other towns on the west coast, in his capacity as a Chinese mandarin. The Abbasids used Alexandria, Damietta, Aden and Siraf as entry ports to India and China. Merchants arriving from India in the port city of Aden paid tribute in form of musk, camphor, ambergris and sandalwood to Ibn Ziyad, the sultan of Yemen. The kingdoms of Vijaynagara and Kalinga established footholds in Malaya, Sumatra and Western Java. The Cholas excelled in foreign trade and maritime activity, extending their influence overseas to China and Southeast Asia. Towards the end of the 9th century, southern India had developed extensive maritime and commercial activity. The Cholas, being in possession of parts of both the west and the east coasts of peninsular India, were at the forefront of these ventures. The Tang dynasty (618–907) of China, the Srivijaya empire in Maritime Southeast Asia under the Sailendras, and the Abbasid Kalifat at Baghdad were the main trading partners. During the reign of Pandya Parantaka Nedumjadaiyan (765–790), the Chera dynasty were a close ally of the Pallavas. Pallavamalla Nadivarman defeated the Pandya Varaguna with the help of a Chera king. Cultural contacts between the Pallava court and the Chera country were common. Indian spice exports find mention in the works of Ibn Khurdadhbeh (850), al-Ghafiqi (1150 CE), Ishak bin Imaran (907) and Al Kalkashandi (14th century). Chinese traveler Hsuan Tsang mentions the town of Puri where "merchants depart for distant countries." Hindu and Buddhist religious establishments of Southeast Asia came to be associated with economic activity and commerce as patrons entrusted large funds which would later be used to benefit local economy by estate management, craftsmanship and promotion of trading activities. Buddhism, in particular, travelled alongside the maritime trade, promoting coinage, art and literacy. Indian vessel as shown in the Fra Mauro map (1460). Trading Christians missionaries, such as Saint Francis Xavier, were instrumental in the spread of Christianity in the East. Christianity competed with Islam to become the dominant religion of the Maluku Islands. However, the natives of these so-called “Spice Islands” accommodated aspects of both religions easily. The European traveller Marco Polo (1292)  described Indian vessels:" ...built of fir timber, having a sheath of boards laid over the planking in every part, caulked with oakum and fastened with iron nails. The bottoms were smeared with a preparation of quicklime and hemp, pounded together and mixed with oil from a certain tree which is a better material than pith." Descriptions between the 14th and 15th centuries indicate that Indian vessels could carry over 100 seamen and were equipped with bulkhead (partition). Ma Huan (1413–51) reached Cochin and noted that Indian coins, known as fanam, were issued in Cochin and weighed a total of one fen and one li according to the Chinese standards. They were of fine quality and could be exchanged in China for 15 silver coins of four-li weight each. 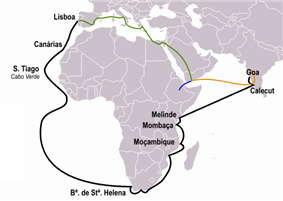 This figure illustrates the path of Vasco da Gama's course to India (black), the first to go around Africa. Voyages of Pêro da Covilhã (orange) and Afonso de Paiva (blue) are also shown with common routes marked in green. Ball, Warwick (2000), Rome in the East: The Transformation of an Empire, Routledge, ISBN 0-415-11376-8. Chakravarti, P. C. (1930), "Naval Warfare in ancient India", The Indian Historical Quarterly, 4 (4): 645–664. Corn, Charles & Glasserman, Debbie (1999), The Scents of Eden: A History of the Spice Trade, Kodansha, ISBN 1-56836-249-8. Curtin, Philip DeArmond etc. (1984), Cross-Cultural Trade in World History, Cambridge University Press, ISBN 0-521-26931-8. Gosch, Stephen S. & Stearns, Peter N. (2007), Premodern Travel in World History, Taylor & Francis, ISBN 0-203-92695-1. Hermann & Rothermund  (2001), A History of India, Routledge, ISBN 0-415-32920-5. Holl, Augustin F. C. (2003), Ethnoarchaeology of Shuwa-Arab Settlements, Lexington Books, ISBN 0-7391-0407-1. Kadian, Rajesh (2006), "Armed Forces", Encyclopedia of India (vol. 1) edited by Stanley Wolpet, pp. 47–55. Kulke & Rothermund  (2001), A History of India, Routledge, ISBN 0-415-32920-5. Lach, Donald Frederick (1994), Asia in the Making of Europe: The Century of Discovery, University of Chicago Press, ISBN 0-226-46731-7. Lindsay, W.S. (2006), History of Merchant Shipping and Ancient Commerce, Adamant Media Corporation, ISBN 0-543-94253-8. Majumdar, R.C. (1987), Ancient India, Motilal Banarsidass Publications, ISBN 81-208-0436-8. Nilakanta Sastri, K.A  (1984), The CōĻas, University of Madras. Nilakanta Sastri, K.A  (2002), A History of South India, Oxford University Press. Sardesai, D.R. (2006), "Peshwai and Pentarchy", Encyclopedia of India (vol. 3) edited by Stanley Wolpet, pp. 293–296. Sardesai, D.R. (2006), "Shivaji Bhonsle and Heirs", Encyclopedia of India (vol. 4) edited by Stanley Wolpet, pp. 53–56. Shaffer, Lynda N. (2001), "Southernization", Agricultural and Pastoral Societies in Ancient and Classical History edited by Michael Adas, Temple University Press, ISBN 1-56639-832-0. Sircar, D.C. (1990), Studies in the Geography of Ancient and Medieval India, Motilal Banarsidass Publishers, ISBN 81-208-0690-5. Tripathi, Rama Sankar (1967), History of Ancient India, Motilal Banarsidass Publications, ISBN 81-208-0018-4. Young, Gary Keith (2001), Rome's Eastern Trade: International Commerce and Imperial Policy, 31 BC-AD 305, Routledge, ISBN 0-415-24219-3. Radhakumud Mookerji (1912). Indian Shipping - A history of the sea-borne trade and maritime activity of the Indians from the earliest times. Longmans, Green and Co., Bombay. Mehta, Asoka (1940). Indian Shipping: A case study of the working of Imperialism. N.T.Shroff, Bombay. ^ a b c d "Gama, Vasco da". The Columbia Encyclopedia, Sixth Edition. Columbia University Press. ^ a b c Halsall, Paul. "Ancient History Sourcebook: The Periplus of the Erythraean Sea: Travel and Trade in the Indian Ocean by a Merchant of the First Century". Fordham University. ^ Rajendra Chola I completed the conquest of the island of Sri Lanka and captured the Sinhala king Mahinda V. Nilakanta Sastri, The CōĻas pp 194–210. ^ The kadaram campaign is first mentioned in Rajendra's inscriptions dating from his 14th year. The name of the Srivijaya king was Sangrama Vijayatungavarman—Nilakanta Sastri, The CōĻas, 211–220. ^ a b c d e f g h (Indian Navy)Early History, National Informatics Center, Government of India. ^ The navy was used in national integration by ferrying troops and securing the coast during the Junagadh state operations—Rajesh Kadian (2006). ^ the Indian navy, among other actions, sank the Portuguese frigate Afonso de Albuquerque—Rajesh Kadian (2006). ^ The navy's fortunes were greatly restored in 1971. After East Pakistan (Bangladesh) seceded, leading to civil war between Pakistan's two wings, the Indian navy trained four task forces of riverine guerrillas. Those frogmen sank or damaged over 100,000 tons of shipping in four months and disrupted ports and inland waterways, the lifeline of the country. In December, after the war formally started, an imaginative, daring raid by Osa missile boats on Karachi harbor sank two warships, damaged others, and ignited oil storage facilities. The Indian armed forces conducted amphibious landings for the first time toward the end of the war—Rajesh Kadian (2006). As a result of the growing strategic ties with the western world the Indian navy has conducted joint exercises with its western counterparts, including the United States Navy, and has obtained latest naval equipment from its western allies. Better relations with the United States of America and Israel have led to joint patrolling of the Straits of Malacca. India's Coast Guard Act was passed in August 1978. The Indian Coast Guard participated in counter terrorism operations such as Operation Cactus. During contemporary times the Indian navy was commissioned in several United Nations peacekeeping missions. The navy also repatriated Indian nationals from Kuwait during the first Gulf War. Rajesh Kadian (2006) holds that: "During the Kargil War (1999), the aggressive posture adopted by the navy played a role in convincing Islamabad and Washington that a larger conflict loomed unless Pakistan withdrew from the heights.". 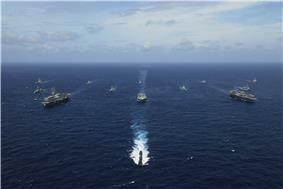 Ships participating in the Malabar 2007 naval exercise from the navies of India, United States, Japan, Australia and Singapore in the Bay of Bengal. In 1947, the Republic of India’s navy consisted of 33 ships, and 538 officers to secure a coastline of more than 4,660 miles (7,500 km) and 1,280 islands. The Indian navy conducted annual Joint Exercises with other Commonwealth navies throughout the 1950s. The navy saw action during various of the country's wars, including Indian integration of Junagadh, the liberation of Goa, the 1965 war, and the 1971 war. Following difficulty in obtaining spare parts from the Soviet Union, India also embarked upon a massive indigenous naval designing and production programme aimed at manufacturing destroyers, frigates, corvettes, and submarines. The Treaty of Nanking was signed in 1842 onboard HMS Cornwallis (1813), made by shipbuilders at the Bombay Dockyard. Shivaji Bhonsle (reign 1664—1680) maintained a navy under the charge of general Kanhoji Angre (served 1698—1729). The initial advances of the Portuguese were checked by this navy, which also effectively relieved the traffic and commerce in India's west coast of Portuguese threat. The Maratha navy also checked the English East India Company, until the navy itself underwent a decline due to the policies of general Nanasaheb (reign 1740 – 1761). Baba Makhan Shah Labana, a noted Sikh of 17th Century is known for trade in sea route to Gulf and Mediterranean region.